I was appointed to the Board of Grafenia in March 2016 and became chairman in 2017. Whilst the Board members are collectively responsible for defining corporate governance arrangements, ultimately responsibility falls with the Chairman and finding the right governance structure has been a core focus and tenet of my time on the Board. I believe the Company had appropriate Corporate Governance arrangements in place even before recent changes to the London Stock Exchange’s AIM rules, requiring all companies admitted to trading on AIM to adopt and comply with a recognised corporate governance code. Notwithstanding that, in line with the AIM rules requirement to adopt a recognised corporate governance code, the Board have chosen to adopt the Quoted Companies Alliance (QCA) Corporate Governance Code published in April 2018. The underlying principle of the QCA code is that “the purpose of good corporate governance is to ensure that the Company is managed in an efficient, effective and entrepreneurial manner for the benefit of all shareholders over the long term”. I believe that achieving that requires the application of corporate governance principles in a sensible and pragmatic fashion that balance the need for process, procedures and high standards of disclosure with the need for flexibility, entrepreneurialism and consideration of the Company’s size, activities and resources. Our report below sets out the ways in which the Group applies the principles of the QCA code at this point in time, and we will provide annual updates on our compliance with the QCA code. Other than the adoption of the QCA code, there have been no significant changes in governance arrangements during the last year. Our strategy to achieve this is to, build our network of studios, buy businesses to accelerate our growth, and license our intellectual property both in the UK and overseas. Our strategy and business operations are set out more fully in the Strategic Report section of the Group’s 2018 Annual Report (pages 13 – 27). Further information in respect of our acquisition strategy can be found on the website here and in our most recent Shareholder Circular. The Group’s principle risks and uncertainties and the systems and internal controls developed to mitigate them are set out in the disclosure to principle 4 of the code. The Company believes strongly in transparency and an open door policy towards shareholder communications. It aims to provide fair and objective reporting and seeks to ensure its strategy, business model and performance are clearly communicated and understood through its half year and full year reports. Past and present versions are published on the Company’s website here together with announcements made during the year. Given the stage of the Company’s development its AGM provides the key opportunity for dialogue with shareholders. All members of the Board attend the AGM. A Notice of AGM is circulated to all shareholders on the register at least 20 working days in advance of the AGM. Our AGM format was significantly overhauled in 2017 to be more inclusive, informative and fun, the growth in numbers of shareholders attending in the past couple of years is testament to the success of this initiative. This year the Company also distributed an invite incorporating an agenda and laid on transport from the Company’s Manchester Hub and Manchester airport to the AGM venue. The Chairman and Company Secretary go to additional lengths to identify and communicate with major shareholders whose holding is via nominee accounts and encourage both voting and attendance at the Company’s AGM. The number of proxy votes received for each vote are announced at the AGM and the results of the AGM are set out in the disclosure to principle 10 of the code. The Company does not presently have significant representation from traditional institutional investors. However at an appropriate juncture it will seek to develop this area with the support of its broker Allenby Capital. The Company actively seeks to engage with its wider stakeholder base in order to maximise decision making, ensure alignment of interests and balance the needs of all stakeholders, whilst meeting its primary responsibility to promote the success of the Company for the benefit of its members as a whole via the execution of its strategy and business model set in the disclosures to principle 1 of the code. the Company’s works council which meets quarterly and includes four production representatives and provides a forum for production staff feedback. an annual two day conference bringing together our customer facing operational senior management and team leaders. The Company believes the best way to achieve alignment with its staff and encourage them to think and act like owners is to help them become owners. We are delighted that approximately half of our team, from production to studios, from designers to installers, participate in the Company’s “Save As You Earn” Scheme which allows employees to save monthly and then purchase shares in the Company at a pre-agreed price. The Company is advocate of apprenticeships and goes beyond its legal obligations such as the payment of the apprentice levy in its commitment to this stakeholder group. In addition to apprentice opportunities across the Group generally, the Nettl Academy was established to offer a free programme of skills training and experience aimed at increasing a graduate’s employability. Graduates from the Nettl Academy are promoted to Nettl partners globally, intern programs are also available, as well as help and support to fund a start-up Nettl business. The Company invests in customer service software and infrastructure to support feedback from theses stakeholder groups and monitors and measures internal targets for response times and quality. Our vision is to be rooted in every team member’s and partner’s success. To that end the Company regularly engages with its partner network through roadshows, conferences, w3pin Discussion (the Group’s on-line message board and forum) and on-line polls and votes, the responses to some of which have shaped key strategic and operational decisions around important aspects of our business, ranging from pricing to environmental policies and considerations. The Company is conscious of the environmental impact of the industry that it operates in. We seek to mitigate and minimise the Company’s impact on the environment through practices and procedures including sourcing of sustainable paper supplies and use of vegetable based inks and supply and promotion of biodegradable products. We recently switched all our matt and gloss laminated print to a new biodegradable film and will continue to cut our use of single use plastics where we can. The Company operates a comprehensive Environmental Management System (of which wider stakeholder feedback forms a part) encompassing the scope of ISO 14001 and setting out processes, procedures and controls and objectives and targets in respect of the Company’s environmental footprint. Principal risks and uncertainties faced by the Group are set out in the Group’s 2018 Annual Report (page 31). The Board is responsible for establishing and maintaining the Company’s system of internal control, which is designed to meet the particular needs of the Company and mitigate the risks to which it is exposed. Such a system is designed to manage these risks, to provide reasonable, but not absolute, assurance against material misstatement or loss, and to maintain proper accounting records to ensure the integrity of the financial information used within the business and for external publication. The Board reviews the effectiveness of the system of internal control and considers whether the Company’s internal controls processes would be significantly enhanced by an internal audit function and has taken the view that at the Company’s current stage of development, this is not required. The Board will continue to review this matter each year. The Board meets regularly to consider matters reserved to it and has put in place an organisational structure with clear lines of defined responsibility and with appropriate delegation of authority to manage risk. The senior management team meets every Monday providing an opportunity to consider operational risks faced and provide stakeholder feedback from across the Group’s operations. An organisational structure exists with defined roles and accountability and a culture is fostered which encourages entrepreneurial decision making while minimising risks. A key component of this is our Leadership Values book which sets out nineteen things we look for and measure our people on ask them to hold their peers, colleagues and leaders to account over. GraphOS, (hosted on w3p, the Platform that manages our entire organisation) provides mechanisms for peer-to-peer evaluation and continuous 360 degree feedback, it’s essentially an early warning system for undesirable behaviour. w3pedia (also hosted on w3p) sets out the written operating procedures for all aspects of our business together with our staff handbook which contains policies providing guidance on things that could get our employees into trouble (including anti bribery, data protection, use of mobile phones whilst driving and much more). The Company has information systems for monitoring its financial performance against approved budgets and forecasts. Documented quality systems include ISO 9001 accreditation, comprehensive health and safety policies and procedures which encompass all aspect of the Group’s day-to-day operations. The Company’s Works Council monitors, reviews and make decisions concerning health and safety matters. The Executive management team reports to the Board on any health and safety issues at every Board meeting. The Audit Committee receives reports from the external auditors on a regular basis and from executive directors of the Company. The Board receives periodic reports from all Committees. The Group retains an insurance broker and maintains appropriate insurance cover in respect of actions taken against Directors and in respect of materials loss or claims against the group and the risks it faces. The types of cover and insured values are reviewed annually. In 2017 we conducted a self evaluation exercise to find out what type of board we need to drive Grafenia forward. We took a long hard look at how many Non-Executive board members we should have and what their competencies should be. The result of that exercise was that the following the 2017 AGM the number of Non-Executive directors (including the Chairman) was reduced from three to two and fees reduced by 25% and 50% respectively. The make-up of the Board is reviewed on an ongoing basis in light of the Company’s development, requirements and resources. 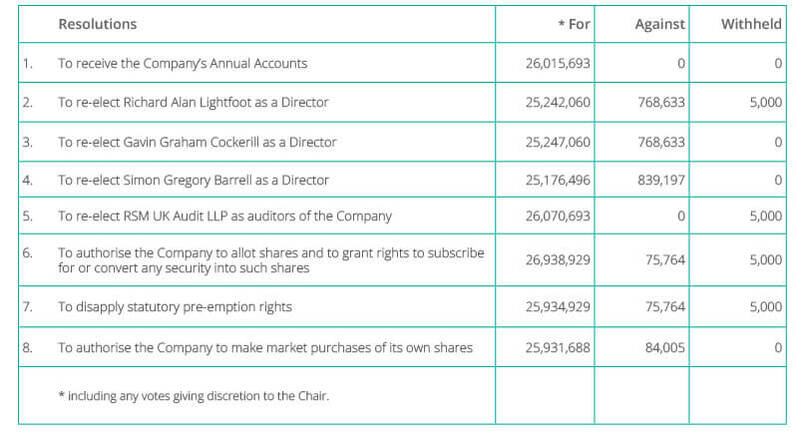 The Board currently comprises two Non-Executive Directors (including the Chairman) and four Executive Directors. During the last 12 months the Finance Director retired from full time work and was replaced by an Interim Finance Director. All of the Directors are subject to election by shareholders at the first Annual General Meeting after their appointment and the article 32 of the Company’s articles of association requires anyone who has been in office for three years without re appointment to seek re-election. The Non-Executive Directors are considered by the Board to be independent under the QCA Code’s guidance for determining such independence. All Non-Executives receive a fixed fee for their services and do not participate in any performance-related remuneration schemes, or have any interest in a company share option scheme (including the Company’s Save As You Earn Scheme). Jan-Hendrik Mohr (Chairman) – attended 7 out of 7. Conrad Bona (Non-Executive Director) – attended 7 out of 7. Peter Gunning (CEO) – attended 7 out of 7. Gavin Cockerill (COO) – attended 6 out of 7 (2 prior to election). Richard Lightfoot (Director & Company Secretary) – attended 7 out of 7 (2 prior to election). Simon Barrell (Interim Finance Director) – attended 1 out of 1 since election. Board meetings and the Company’s AGM are held at various Group premises giving, in particular the Non-Executive Directors, access to different operations and the opportunity to develop a wide understanding of the Group’s activities. The Company Secretary reports directly to the Chairman on governance matters. The Board believe that Richard Lightfoot’s appointment as Director and Company Secretary is appropriate at this stage of the Company’s development and given its requirements and resources. This arrangement is assessed on an ongoing basis and separation of duties will be implemented as appropriate. The Board considers that all of its directors are of sufficient competence and calibre and between them provide an appropriate and effective balance of skills and experience, including in the areas of retailing, wholesaling, marketing, print production, software development, ecommerce, finance and mergers and acquisitions. Directors’ biographies are set out here. The Board is supported where necessary by its external professional advisers (details of the Company’s auditors, solicitors, nomad and registrar can be found here). The Board continually reviews the performance of third party advisers to ensure they are the most effective business partners for the Group. Our Auditors were last changed in July 2017. Directors have access to advice and services of the Company Secretary and there is a procedure for all Directors, in furtherance of their duties, to take independent professional advice, if necessary, at the expense of the Group. Whilst the Board presently consists of one German national and one member with both Canadian and British citizenship we are mindful of the absence of ethnic diversity and gender balance. The Board is committed to continual assessment of its composition as the Company evolves. The Company Secretary provides Directors with updates on key developments relating to the Company and legal and governance matters including advice from the Company’s broker, lawyers and advisors. An evaluation of Board performance was conducted internally in 2017.
they are performing their roles and carrying out their responsibilities to the highest standards. their contribution is relevant and effective. where relevant, they have maintained their independence. Appraisals are carried out each year for all Executive Directors and to assess overall Board composition. The appraisal process is an ongoing consideration of the Board as a whole. The Board intends to implement other procedures for appraisal of Board performance, that of each committee and each director in the coming year including where appropriate utilising the services of an independent third party organisation, and will provide an update on these measures in next year’s Corporate Governance statement. Presently no formal Nomination Committee exists in view of the stage of growth of the Company. Appointments to the Board and succession planning are considered by the Board as a whole and are made on merit against objective criteria relating to the skills, knowledge and expertise required, and with due regard for the benefits of diversity on the Board and requirements of the Company. The Board firmly believes that culture is driven from the top and through sound Corporate governance, it takes ultimate responsibility for the culture that is developed and evolves under its leadership and guidance. That’s why we developed our Leadership Values which sit at the centre of GrafOS. GrafOS is our operating system for people. Each role in our business is part of a career storyline with required “Intelligence” levels. Team members collect badges as they acquire competences. We encourage team members to ‘catch colleagues doing things right’ and leave positive feedback against specific Leadership Values they’ve observed. Likewise, if they spot someone behaving contra to our Leadership Values, they can share a private ImproveNote with the individual and their leader. It’s all designed to encourage and deliver ethical and entrepreneurial behaviour. The Company’s staff manual sets out whistleblowing policy and procedures. The Board is responsible to shareholders for the proper management of the Group. The Board is responsible for overall Group strategy, approval of major capital expenditure projects and consideration of significant financing matters and approval of Annual and Interim results and budgets. The Executive Directors have responsibility for the day-to-day operational management of the Group’s activities. The Non-Executive Directors are responsible for bringing independent objective judgement to board decisions. All directors are supplied with the Company’s continuing Obligations memorandum which is reviewed and updated regularly. The memorandum sets out and explains Directors responsibilities and obligations under the AIM Rules, the Market Abuse Regulation and other wider applicable legislation. Setting and Review of Strategy and Performance. Maintenance of Financial Reporting and Controls. Maintenance of Internal Control and Risk Management systems. Investor Relations and Regulatory communications. Constitution of Board Membership and other appointments. Setting of Directors and Senior Management Remuneration. Delegation of Authority amongst the Board and its Committees. The Board maintains a rolling scheduled programme of seven board meetings each year aligned with relevant events in the Company’s financial and trading calendar. Additional meetings are held as and when required. A formal agenda is prepared for each meeting, Board papers including a CEO’s report and KPIs, and FD’s report are circulated in advance and minutes are circulated following each meeting recording actions arising and noting any unresolved matters. We increasingly involve non board members in relevant Board discussions and will extend this in the future. The differing roles of Chairman and Chief Executive are acknowledged and there is a clear division of responsibility at the head of the Company. The key functions of the Chairman are, to overseas the adoption, delivery and communication of the Company’s Corporate Governance model, the effective conduct of Board Meetings and meetings of shareholders, to ensure that all Directors are properly briefed in order to take a full and constructive part in Board discussions, and to ensure the Group has appropriate strategic focus and direction. The Chief Executive has responsibility for leading the implementation of agreed strategy and managing the day-to-day operations of the Group. The Board has established an Audit Committee and a Remuneration Committee. In view of the stage of growth of the Company there are no formal Nomination Committee or Corporate Governance Committees, however these arrangements will remain under review. The Audit Committee and Remuneration Committee presently comprise of Jan-Hendrik Mohr (Chairman) and Conrad Bona (Non-Executive Director), the Company’s present policy is for any new Non-executive Directors to join both Committees. The Audit Committee’s principal tasks are to review the scope of external audit, to receive regular reports from the auditors, and to review the half-yearly and annual accounts before they are presented to the Board, focusing in particular on legal requirements and accounting standards as well as areas of management judgment and estimation. The Audit Committee is responsible for monitoring the controls which are in force to ensure the integrity of the information reported to the shareholders. The Audit Committee acts as a forum for discussion of internal control issues and contributes to the Board’s review of the effectiveness of the Group’s internal control and risk management systems and processes. The Audit Committee meets at least twice a year including immediately before the submission of the Annual and Interim Financial Statements to the Board. a review of the non-audit services provided to the Company and related fees. discussion with the auditors of a written report detailing all relationships with the Company and any other parties that could affect independence or the perception of independence. A review of the auditors’ own procedures for ensuring the independence of the audit firm and partners and staff involved in the audit, including the regular rotation of the audit partner. Obtaining written confirmation from the auditors that, in their professional judgement, they are independent. An analysis of the fees payable to the external audit firm in respect of both audit and non-audit services during the year is set out in Note 4 of the Group’s 2018 Annual Report (page 57). The Audit Committee advises the Board on the appointment of external auditors and on their remuneration for both audit and non-audit work. Ultimate responsibility for reviewing and approving the Annual and Interim financial statements remains with the board and a statement of directors’ responsibilities in respect of the accounts is set out in the Group’s 2018 Annual Report (page 38). The Remuneration Committee is responsible for making recommendations to the Board on the Company’s framework of Executive remuneration and its cost. The Committee determines the contract terms, remuneration and other benefits for each of the Executive Directors, including performance related bonus schemes, pension rights and compensation payments. It also considers and oversees the implementation of any share incentive schemes, the Company’s Save As You Earn scheme being the only such scheme at present. The Board itself determines the remuneration of the Non-Executive Directors. The Remuneration Committee meets at least once a year. A Directors’ Remuneration report is set out in the Group’s 2018 Annual Report (page 39). The Board places a high priority on clear, fair and objective reporting with its various stakeholder groups. The Company is presently of a size that doesn’t support having a dedicated investor relations department, however the CEO’s mobile phone number is provided on all announcements and the Company Secretary’s contact details are set out on the website for shareholder enquiries. The Chairman also talks on and adhoc basis with major shareholders and provides feedback to the Board. We are conscious that, given its present size, the Company attracts limited analyst attention. To that end the CEO maintains strong links with relevant industry media and seeks to articulate Company strategy consistently through them. Calls with journalists are also held to coincide with the release of the Group’s Annual Report. The Group’s website is regularly updated and in addition to the Corporate Governance Statement sets out past and present Annual and Interim Reports and Accounts and all Announcements.